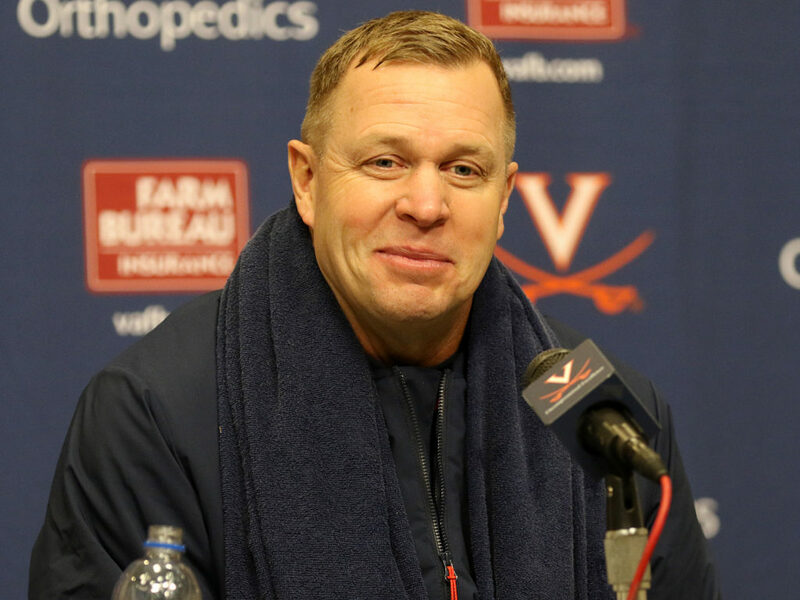 For months, including last offseason and into the preseason, Virginia football head coach Bronco Mendenhall has publicly acknowledged the importance of his program defeating arch-rival Virginia Tech, which has won 14 consecutive games in the series. “Beat Tech” has not just been stated, it has been literally written on the locker room walls in Scott Stadium. The goal has been clear for months. Now, the game is here. Virginia football (7-4) heads to Blacksburg on Friday, November 23, to take on a 4-6 Hokies squad. Coach Bronco Mendenhall took the podium ahead of his team’s regular season finale to discuss the Hokies and more. Paraphrased as always, here are notes from Coach Mendenhall’s November 19 presser. We will add the full transcript once it is provided by Virginia Athletics Media Relations. 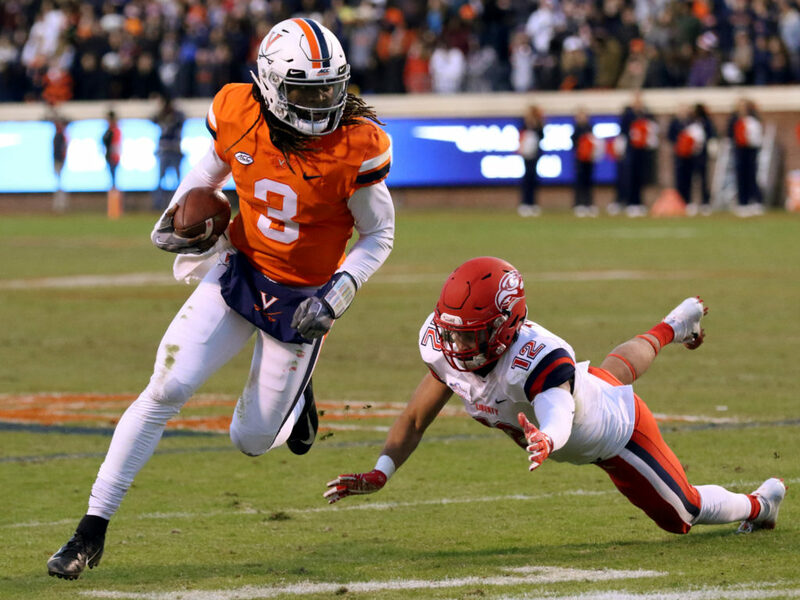 – Making defeating Virginia Tech a clear objective so long ago has ensured that those Cavaliers playing in this game for the first time (such as quarterback Bryce Perkins) know how important this game is. Last-minute messaging from upperclassmen is not needed. – Whether the amount of attention Virginia has focused on this game results in a different outcome or not, we’ll find out over time. Regardless, Mendenhall acknowledges this game is “not just another game.” You can’t take over your conference if you haven’t taken over your state, especially with the in-state foe being a division rival as well. The Virginia Tech game is more important to UVA’s growth than any other game on the schedule. – Mendenhall gave his players the option of not speaking with the media this week prior to the Virginia Tech game. They accepted. Mendenhall knows this won’t be a popular decision, but he believes the players need to devote as much time as possible to preparing for this game. – UVA has a significant hurdle to overcome in terms of history with the Hokies having won 14 straight and 18 of the last 19. This game, though, is the 2018 Virginia team versus the 2018 Virginia Tech team. Mendenhall has acknowledged the past results with his team. – It’s very clear to Mendenhall how important this game is to the University, the fans and the players. – Despite Virginia Tech’s 4-6 record, there is “no chance” the Cavaliers will be overconfident. There is still so much work to do at UVA. – Assessing the Hokies, Mendenhall says Virginia Tech has had critical injuries at critical spots, but they play hard and are coached well. Tech’s recent schedule has been difficult. The schedule has been challenging and there have been a few key injuries, but the coaches and schemes and culture at Tech remain strong. Any differences between this Hokie team and previous versions are due to injury. Continuing with his assessment, Mendenhall said the Tech defense has had struggles with consistency, but in between those struggles it looks like a typical Tech defense. Discussing the Tech offense, Mendenhall praised the scheme and design of Virginia Tech head coach Justin Fuente. Tech has tailored its offense to get the most out of quarterback Ryan Willis, who is playing in place of injured starter Josh Jackson. Mendenhall has always been impressed with Fuente and his offenses. – Virginia’s defense went with a more traditional 3-4 look versus Georgia Tech because Georgia Tech keeps the same personnel on the field. Virginia Tech’s offense is more diverse, which means there will be more flexibility and diversity with UVA’s defense this week. – A short week plus the Thanksgiving holiday presents logistical issues. The players will practice Wednesday before enjoying a few hours for Thanksgiving, either with family or coaches, Wednesday evening. – Virginia’s junior quarterback suffered a left ankle injury when he was sacked by Georgia Tech’s Brant Mitchell for a safety in the first quarter of last week’s loss in Atlanta. Perkins missed a series but returned, and his level of play post-injury even surprised his coach. According to Mendenhall, Perkins said the ankle felt better than he thought it would this morning. – The ideal remains for true freshman quarterback Brennan Armstrong to redshirt this season. Armstrong has now played in three games after subbing a series for Perkins last Saturday. If he plays in four or less, he can preserve his redshirt year. For Mendenhall, a big takeaway from this season is that Virginia has a “really good” quarterback behind Perkins. Armstrong, who Mendenhall says is currently the heir apparent to Perkins, has given Virginia’s defense fits in practice. – Virginia fans got their first long look at Ohio State graduate transfer defensive lineman Dylan Thompson against Georgia Tech. Thompson, who recorded six tackles versus the Yellow Jackets, played well and tried hard in Atlanta. Coach Mendenhall is proud of Thompson, not just for his performance against Georgia Tech but also for fighting through adversity to play at Virginia. Thompson enrolled at UVA later than expected and it has taken him up until the past few weeks to get in good enough shape to make it through practice. While Thompson’s production is coming later than hoped, the timing is good given Mandy Alonso’s injury. Coach Mendenhall put to rest the discussion of Thompson getting an additional year of eligibility. He said they inquired about it but didn’t get the answer they were hoping for, so Virginia Tech and the bowl game will be Thompson’s final two games as a Cavalier. That being said, Mendenhall is “so glad” Thompson is on the team. Without his emergence, it would have been difficult for the defense to function last week. Thompson was one of the best front-7 players versus Georgia Tech. – True freshman defensive end Grant Misch earned the first playing time of his young career against Georgia Tech. In fact, the 6’4”, 235-pound Misch started versus the Yellow Jackets. The need for defensive linemen provided Misch an opportunity to practice with Virginia’s travel team (a promotion from the scout team), and he responded by playing well and becoming reliable. Once the Georgia Tech game started, Virginia went primarily with redshirt freshman Tommy Christ, who was doing a “nice job” according to Mendenhall, over Misch. Aaron Faumui, a true freshman, also received some action. – The emergence of sixth-year senior cornerback Tim Harris as a “physical, consistent, durable, tough” player might be Mendenhall’s favorite story of the year up to this point. – Sophomore safety Joey Blount has missed the past two games with injury but has been cleared to practice tonight. Coach Mendenhall isn’t sure how Blount will look, so whether or not the Georgia native will play versus Tech remains a question mark. BRONCO MENDENHALL: I really like the way my team played this past week. They played hard. I thought they played physical. They are becoming what I expect and how I expect, a good football team, a physical football team and a competitive football team to play every week. As the standards keep raising, the expectations from me to them keep raising. We expect to win and we are always disappointed and frustrated if we don’t. And that’s becoming clear, that it’s not okay, because we expect to win, and especially when we have a huge influence on outcome. We made too many mistakes in that game. Even though it wasn’t a significant amount, the mistakes were significant enough, especially in the special teams. So we have to get those corrected in order to not have those put us at risk again for games that come right down to the end, which as the ACC opponents and those games usually do, to win. They’re very competitive, especially on the road. But I did like the way we played. I was encouraged really, especially defensively first, offensively second, and then special teams with room to improve certainly. Looking forward to our next game and our matchup versus Virginia Tech. Anxious for all the preparation that comes with it and the urgency that comes with it, especially playing on Friday — and not a Friday night game, but a Friday afternoon game. That accelerates the timing and the urgency. Even though a rivalry game normally does that anyway, so this just adds a little bit more to it. It’s always exciting to have an occasion to rise to, something that’s meaningful to play for, at the end the year, and in this case for or program. So I’ll be glad to take questions. Q. Will you have more flexibility this week as far as using nickel and subpackages? BRONCO MENDENHALL: Yeah, there will be more flexibility just because Virginia Tech is more multiple. So like we’ve been doing really for the entire season once Richard Burney went down, and certainly when Mandy Alonso went down, but really core philosophically we look to match and put our best 11 players on the field versus what our opponent does every single down. Because of what Virginia Tech does, that will — they’re more diverse than Georgia Tech was, which usually will lead to a more diverse approach defensively than a team that just keeps the same personnel on the field. Q. Don’t want to get bogged down in this, but the decision to let the players not speak this week. You are at a point where interest in the program is kind of at an all-time high and building. What was behind shutting that off? BRONCO MENDENHALL: Yeah, in my team meeting this morning there is urgency to advancing our program. There is urgency to this preparation. I certainly knew it wasn’t being widely — or wouldn’t be everyone’s most popular decision. I did frame to them what we need to get done and what timeframe and what urgency, and that normal isn’t enough. We needed every second, and so I told them I would be glad to speak, because it’s part of my job to represent the program. I basically said everything that they’re doing that’s not involved in going class or winning this game is actually not going to help us. I did give them a choice. I think it gives our team the best chance to be focused, prepared and ready to play the way they’ll need to play in a very difficult environment against a good team. Q. It sort of follows suit with how you have approached this game differently than past coaches not saying it’s just another game. Why do you think that mentality will yield a different result? BRONCO MENDENHALL: Well, whether it yields a different result or not, we will certainly find out over time. But I think I’m just stating the obvious. It’s not just another game. Virginia hasn’t won the game in a significant amount of time. It’s an in-state rival game. It’s hard to take over a conference until you take over your own state, and certainly then your side of the division. So to say it’s just another game, I think we all realize the implications aren’t just normal implications. They’re at a higher level. So, again, my approach has always been just to state the brutal facts. This game is more important to Virginia in terms of our regrowth and development and recapturing an exceptional college football team than a normal game. Q. Could you talk a little bit about Dylan Thompson’s journey, and specifically in the last month. BRONCO MENDENHALL: Yeah. How much time do you have? So Dylan, any time we consider a graduate transfer there is a couple core principles that are in place. We will only consider them if they’ll get their master’s degree and if they are at a position of need where they could be an immediate starter and have an immediate impact. We thought Dylan would do that. Upon arrival, his eventual arrival, after taking extra time to qualify academically, by the time he arrived a large amount of preparation was already done. Entire training camp was missed, if I remember right. And our program is not easy. We work really hard and we have very high expectations, and physical conditioning and mental toughness and the demand daily is at a premium. Dylan arrived missing all of that. Even though he had been at Ohio State, he had been injured and he spent the better part of — he has spent the better part of his time here just gasping for air and trying to get enough oxygen with trainers and just trying to make it through practice. The last couple of weeks he has started to make it through practice. That just means from beginning to end. With that, he’s qualified for repetition, and with the repetition, he’s been able to demonstrate his ability. With demonstrated ability, and now increased need, that’s all kind of came together last week, which was week 11. Just in time. He played well. He tried hard. And I was really proud of him not only for sticking to it, but through it. Because, yeah, he’s a fifth-year player coming from a program of prestige coming in under circumstances that we expected more and he expected more. It was just the opposite, until Saturday, and that was I think how we all would’ve hoped it has started. But better late than never. It is actually more impactful now that he’s finally reached that knowing how difficult the transition has been for him. I was really happy for him. He’s just handled himself really well. He’s worked hard. He’s been humble and learned and embraced and likes what he’s doing and where he is. Q. Possibly he’ll play next year? BRONCO MENDENHALL: Not that I know of. I don’t think there is an additional year that is available. I think we did look into that, but received a response that that was not possible. This is his only year, so he will have the upcoming game against Virginia Tech and then our bowl game. Again, I’m so glad that he’s here. Without his ability and his work ethic and his transition, would’ve been very hard to function last week. Not only did he play, he played really well. Practice I think led a strong defensive performance. In terms of his grades and production, he was one ever our best front seven players. Q. Two questions: Can you give us as injury update on Bryce [Perkins] and Joey [Blount] and anybody else? BRONCO MENDENHALL: From what I know today, which changes during the week, I’ve been told that Joey will be able to practice tonight. I don’t know what that will look like. I don’t think anyone does. But he’ll give that a shot. And Bryce basically reported he felt better than he expected to today. I don’t know what that means either, so you now know what I know. Q. The other thing is can you talk about Olamide’s [Zaccheaus] progress throughout the year? BRONCO MENDENHALL: Olamide is only second I would say to Bryce, and as he goes, we go as a football team. In terms of scoring and production and the more touches Olamide gets, the better chance we have to win the game. Same with Bryce. Now that Joe Reed is emerging, that’s even better. We have made a specific effort for Olamide to get the ball. Certainly haven’t hit the mark every game, but that’s as much our fault as a staff as him not being on that game, or sometimes defenses just do a little bit more to eliminate touches to him. There has been some of that. But his consistency, his leadership, but more importantly production, that’s really been impactful. So players get tired of hearing about it, but I talk about consistency and durability and production. Olamide has become more of all of those things. He’s more consistent and more durable and more productive that he’s ever been. That has a lot to do with the kind of football we’re playing and the progress our team is making. Q. This is the first time since I believe 1992 that Virginia will go into this Tech game with a better record. What have you seen from them on film and what’s different about this Virginia Tech team? BRONCO MENDENHALL: Not much. To be honest, from my lenses now I get to see all the phases and spend a lot of time. Again, everyone has battled injuries and they are no different. They have had some critical injuries at critical spots. Man, they’re well coached and they play hard and I think they’re schedule has been tough. You know sometimes it works out that way where your crossovers game or some of your nonconference games are a little bit more challenging. I said that to Pat Narduzzi before we played. I acknowledged who they had played. I knew that. So sometimes Game six or seven it’s still not clear by record. That’s why you play an entire 12 games. I think they’ve had a challenging schedule, I think they’ve had a few key injuries, but their coaches and schemes and culture I think is strong. Any differences would be, again, because of probably injury more than anything else. Q. Now you’re third year into this rivalry, and now you have a pretty good feel for it. How does this arrival compare to BYU-Utah and how does your preparation, plan, approach you’re taking compare to the way you approach that game? BRONCO MENDENHALL: They are distinct and different. I don’t have words to describe the BYU-Utah one because faith is mixed into that. Much like politics, it brings out a whole different thing. But I’m very clear how important this game is to our university, our fans and our players. Yeah, I’ve learned, as always rivalry games and just taking over any job, it becomes clearer what’s really important and how you might need to go about something to give your team the best chance for results. We have a significant deficit to overcome when you look at history; however, this is ’18’s team versus ’18’s team, and that’s our focus. So, yeah, I’ve acknowledged the past with our team, certainly with our fans, and I’m very clear how important this game is to them, all entities, including administration and leadership of institution. Again, I think it’s disproportionately more valuable than any other game at this point in UVA’s football program. Yeah, it’s not just another game. It has more value. It has a bigger chance to impact our program, to generate momentum, and continue building does doing thing that haven’t been done for a while. Those things have to be done to make progress. This is just one of the next things we have to do, and targeted to a while ago knowing just objectively. And it’s not personal, but it is objective. This game for the University of Virginia is more meaningful than any other game. That’s the way we’re approaching it. Q. It’s been quite some time in this rivalry that Virginia would be favored to win. You said ’18’s team versus ’18’s team. You’ve identified it as a goal to defeat them. But now your team you could argue is playing better, has the better record. People prognosticating would look at you all as favored to win the game. Does what you’re chasing mitigate that whole trap of overconfidence, so to speak? BRONCO MENDENHALL: Yeah, there is no chance we’ll be overconfident. There is so much work to do in our program and the things we have to correct. And since when? Well, as you probably already know, I don’t listen or look as to who is favored or not, and I encourage my team not to the same. That doesn’t mean we’re perfect and some don’t. But more that we look the more we’re influenced. The more we’re influenced the more it changes our mindset. The more it changes our mindset the farther it gets from where it needs to be. So I just frame that for the guys, and usually through maturity it brings us back to just the work. If I feel it drifting, practice just gets really hard. It will bring them back purposefully. Who is favored or not means nothing to me. We have a really good opponent to play in the ACC on the road in rivalry setting. That alone is challenging enough. Q. As you mentioned, the first Friday game was a night game, 7:30. This one is 3:30. The proceeding game that Saturday was a noon game against Carolina and you were at home; on the road for a 3:30 game. Didn’t get back until 10:30 or so. Moreover, you have Thanksgiving in the middle of this week. How has that changed the coach’s preparation? BRONCO MENDENHALL: Yeah, it’s challenging. And, again, I don’t expect anyone certainly from the media’s perspective to agree. That did have a lot to do with what I chose to do with players, because of that. It’s just not another early game. Thanksgiving is right in the middle, plus it’s a way. The circumstances are different, and we need every second we can get. Again, I don’t expect it to be agreed with or applauded. My job is to help our team get ready, and that’s what I chose to do matter of factly. So, yeah, the coaches, as you know we don’t work on Sunday, so the impetus to then try to hold that principle, but then also make sure the team is ready. So, yeah, there was church times at this time and we were working around church for probably the first time in one of the times that I’ve been the head coach just because of all the thing you just mentioned. It wasn’t in the place of, but we just tried to make ever I think co-exist for one day in a setting that jammed everything together and changed our schedule a little tighter. Q. The players will have Wednesday night off. BRONCO MENDENHALL: Yeah, Wednesday evening the players are going to — in any family members come into town, the players have a chance to eat Thanksgiving with their families Wednesday night or go to the coaches’ houses to have Thanksgiving dinner, which most are doing. That’s after a full day of work. We’ll work all day Wednesday, playing, practicing, meeting and the evening there is about a three-hour window where everyone will be able to enjoy for a few — seems like moments — but a few hours Thanksgiving. Then it’ll flip right back to the day before the game, which is Thursday, and we’re traveling. Is a just one other unique challenge to manage, and maybe adds to the intrigue and the test of what it takes to get ready for this game in terms of it’s not a normal game. Because it’s not. The timing is more restricted. Thanksgiving is right in the center of it, and then make it a day earlier and not only a night game but a day game. Yeah, a lot going on. Q. When you look at the progress your running game has made from a year ago to where it is now, how much does that do for you confidence-wise entering a game which, as you said, is not like most games? BRONCO MENDENHALL: Yeah, it adds stability. It’s really difficult to manage a game if you can’t run the football when you want to. I’m still not satisfied how we’re running it and its efficiency and its physicality and its effectiveness. What we are doing well is Bryce’s ability at the quarterback position to run the ball and scramble. That’s been a huge boost in our yardage. The traditional run game is still a work in progress. I’m not satisfied with that. When you put those two things together, that has giving us another element that makes it more difficult for us to defend. That’s been fairly consistent throughout the entire season. The games that it has not been we haven’t been; the games that this has been, we have. Flip it the other way. The games we’ve defended the run well, we’ve mostly won, and the ones we haven’t we’ve mostly lost, with the exception of last week on both cases. Q. Two questions: First, I’d like to go back to last week for a second. Fourth quarter you guys are down 24-21; you guys drive to the Georgia Tech 13; you’re facing a third and one. Bryce tries to throw a touchdown instead of going for the first down. Was that the called play or was that a check by Bryce there? BRONCO MENDENHALL: A called play. Sometimes we as a staff try to be unpredictable, and we wanted to be aggressive. We had already made the decision in the fourth quarter at any time as the game wound down, if we scored a touchdown and the touchdown was tied, we were going to go for two. That was already part of our plan. So keeping consistent with that, winning on the road is harder than winning at home. Yeah, we chose to take a shot and thought we might be able to catch them playing short yardage defense. Luckily for them, they weren’t and unlucky for us. Q. You talked a lot about how different the team is, the culture is. Given how competitive last year’s game was, given how [Virginia] Tech seems to be down a little bit, is there any different feel going into this game in the locker room than in past years? BRONCO MENDENHALL: No, there is no difference. We want to win. That isn’t just this game, it’s every game. That is part of our standard. I was hurt and devastated — that’s too strong a word — disappointed that we lost the last game. So are our players. It’s noticeable now when I walk into the team meetings. First of all, when I walk into the locker room after the game if we haven’t won it’s noticeably different because the expectation is different. They go in expecting to win the game. Then it hurts longer, more, and I see it Monday when I come to the team meeting. So this is, yeah, the best way to recover from being disappointed, is to get right back to work and have success. That just adds one more thing that makes this game important. Q. Grant Misch will be one the beneficiaries of the new rule. You were able to play him this year and he’ll retain the year of eligibility. He makes his debut in Game 11, and not only plays, but starts. Had he been moving toward that? Had you been thinking about playing him earlier? Q. Just because the option? BRONCO MENDENHALL: Again, our need for additional D-lineman. We called him up to practice with our travel team, and next thing we know, man, he’s playing really well. He’s doing a nice job. He’s a first-year and he’s skinny and he doesn’t look like he belongs in there yet, but he just kept practicing relentlessly and hard and physical and doing the right things and became trustworthy. Yeah, by the time it got to Thursday it was, okay, who has done the best job this week. It wasn’t the season, but this week. He had outperformed some of our other defensive lineman to earn the chance to start. He did not play as much as some of the other D-linemen once the game got going, but it’s a huge compliment that he earned that coming literally from the preparation team and the team that’s looking to help the opponent, and then starting against Georgia Tech in the option. He had a great week of practice. Tommy Christ ended up once the game started doing a really nice job. So the volume of plays kind of shifted, and the Aaron Faumui was mixed in as it went. Dylan Thompson we didn’t have any idea how well and consistent he would play, but did so he kept playing. Grant earned the start, and then it was taken over by Tommy, and Aaron [Faumui] was supplemented as needed is how it ended up playing out. Again, I will love to guess during practice and identify exactly how the game will be, but it was just lucky that Coach So’oto had those guys prepared to the level they are so we could play that many. They played well. They really did. Q. From what you can gather, have the veteran players like a Juan Thornhill, shared with Bryce Perkins, some of the younger guys, how big of a deal this rivalry is, and do you hope they have done that? BRONCO MENDENHALL: You know, one of the things by making it such a clear objective so long ago, meaning coming out of last season and going through the summer, is that that education and on-boarding and orientation has been happening. It’s already done. It’s not now all of a sudden, oh, it’s Virginia Tech and now this is what that’s like. This started, and by design, a long time ago. All that’s been done. Nothing new in terms of messaging from player to player or from coach to player that wasn’t started a long time ago. I learned just now after becoming more familiar with the university of the Virginia with this rivalry and this circumstance, and hopefully we have addressed it and I’ve addressed it the most appropriate way for our team to have their best chance to play the kind of football they can. And part of that is not now having to recalibrate and have some new messaging that is just one other thing to add to a short week anyway. Q. Follow up. Bryce visited for the UVA Tech game. BRONCO MENDENHALL: I had forgotten that. Q. Then you might not have a great answer for this question. BRONCO MENDENHALL: I was going to say, did he? Q. You might not have a great answer for this question. I was going to ask if that’s something that’s had an impression on him in terms of the rivalry? BRONCO MENDENHALL: Yeah, I couldn’t say. I didn’t remember that is when he came. So, yeah. Q. Other one was you said, and Kelly [Poppinga] also did, that Tim Harris had been playing physical best football. How did he play at Georgia Tech? BRONCO MENDENHALL: Yeah, he’s done a really, really nice job. He’s physical and he’s consistent and he’s durable and he’s tough. Yeah, might up my favorite story of the year to this point. I’m really, really proud of him on who he’s becoming and how he’s just battled. It’s gratifying as a coach to see just growth and progress. Q. What’s your best-case scenario for Brennan Armstrong at this point? BRONCO MENDENHALL: Man, that we don’t have to count this year as one of his years. That starts it. Every time we put him in he scores touchdowns if it we do have to put him in. I really like him. He’s Bryce’s heir apparent currently. One of the biggest takeaways from the season is we have a really good quarterback behind Bryce. I’m a fan because, again, I watch him every day against the defense. They have a hard time stopping him and he thinks he can make every play. His pulse might have got to like 42 in that game when he went in. I mean, he just threw it like it was practice. Q. Are you hoping to get this year back? BRONCO MENDENHALL: Yeah, anything I can do in terms of managing to not have that year count is what we’ll do with him. He’s at three. Q. Coach, you mentioned Tech’s tough schedule. You guys have played a couple similar opponents and not given up the same kind of numbers defensively. Without giving up too much game plan, what have you seen on film from Tech that’s not working defensively? BRONCO MENDENHALL: First of all, they have an exceptional coach that’s leading their defensive side who has had years and years of success. I think their players try hard. Only thing I can say is there has been struggles with consistency, and that sometimes has given up big plays or points. Then in between it looks like Tech’s defense again. So consistency is probably the thing that’s been a difference if I’ve seen one, not capability. Q. Pretty sure that on this day last year neither Brennan nor Bryce had committed to the program. You had been recruiting both and were involved Lindell [Stone] was the only quarterback who was a lock to be in the program in 2018. Do you ever think about how fortunate you are and the program is the way things worked out on that front? BRONCO MENDENHALL: You know, I think back to Holly and I living in the RV on our property and I think about our first year winning two games. I think about things like that all the time. It adds perspective, but doesn’t change urgency. So a lot has been accomplished I would argue in a fairly short amount of time in a framework that is adding a really solid foundation and format for consistency and sustainability with two great opportunities to add to what’s already been done this year. So if you start to think about what if, there are two pretty big what ifs for this team for them to chase and strive for and reach for. I would love to help them. Q. Specifically to the game and appealing to the old defensive coordinator in you, specifically what you’ve seen from Ryan Willis and Tech offensively that concerns you and you’ll need to address? BRONCO MENDENHALL: I think Justin, Coach Fuente, does a really nice job going all the way back to the TCU days. Their scheme, use of the field and personnel and design is really — I think is really strong. What they’ve done is they’ve — with their quarterback now they’re highlighting what his skillset is, still maintaining as much of the existing identity as possible of what they’ve always done and done really well. To their credit, they’ve tailored it to get the most out of the player they have at quarterback within their design. Yeah, I’m impressed, but I always have been with just how they’ve operated offensively and the process they’ve had. Q. You mention the differences in the BYU-Utah rivalry and this rivalry. Are there some similarities for you personally in regards to having players embrace the rivalry and the importance of it and not being shielded from it, just having it be a normal game? BRONCO MENDENHALL: Yeah, I think I’ve been really clear and fairly outspoken going into the third year of how important the game is. That simple stance I don’t think shields anybody. It’s made it clear to anyone that’s been around our program that it’s more impactful and important and will do more for our program and generate more momentum. It’s significant. My message doesn’t really change in whom I’m sharing it with. Man, if any of our players feel differently than that they haven’t been listening and probably are not in the right team meeting room. Q. Obviously you want Bryce to say healthy and not take big hits. What was your reaction when you saw him get dinged up in to the last one? And hurting and being injured, how physically tough has he been this season? BRONCO MENDENHALL: Oh, man, he’s fiercely resilient and he’s very tough. When he went down there was a combination of all kinds of things. We’d just given up a safety. There goes our quarterback. Right after that we give up a free kick for a touchdown. So I don’t know what circumstance in college football in a three-play or two-play stretch is worse than that, but that’s pretty high up there on the scale. But then to hear later that he might return, I was like, How can that be? There is a fairly common practice sometimes once an x-ray is made, if it’s not a fracture, not a break and pain and there is not a significant or more risk to injury being done, sometimes players have pain medicine that allow them to fight through it, which sometimes works and sometimes doesn’t. Sometimes they’re effective and sometimes not. But to see Bryce play the way he continued to play when he came back, I certainly didn’t expect that. Q. Didn’t he break his finger earlier in the season and then come back? BRONCO MENDENHALL: Yep. He just has been — normally when you have a dynamic player at quarterback that runs and is so athletic, the chance that he remains healthy and not affected week in and week out for the number of plays, either contact or hits or just simple volume of what it takes to manage practice and games, they’re normally not as consistent. He’s been just the opposite, where you basically see the same Bryce Perkins and our same quarterback every single game. It’s really been helpful to our team as they learn and grow. Q. Along those lines, in an interview last week, Paul Johnson raved about Bryce like he never raves about anybody. Did he say anything to you about Bryce before or after the game? BRONCO MENDENHALL: You know, he didn’t. Normally Paul and I, we visit quite a bit before the game, but Robert [Anae] and I have worked with Paul and worked for him for a long time. They were having a sit-down before the game, just I just walked by and made — I teased Robert in front of Paul and asked him to get him straight for me and let them laugh and I just kept walking. The time that would’ve been available didn’t happen for this game. Then afterwards with the way the game finished, I really wasn’t in one of those chatty moods. Really wasn’t the chance after.